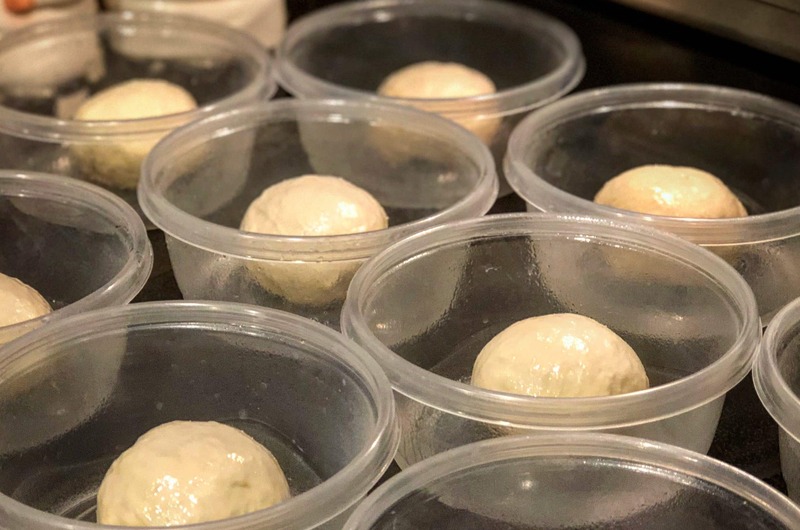 Let’s face it – sometimes you just don’t have the energy, or the time, for making pizza dough from scratch. You know there’s nothing like it, but some days a substitute is just what the doctor ordered. 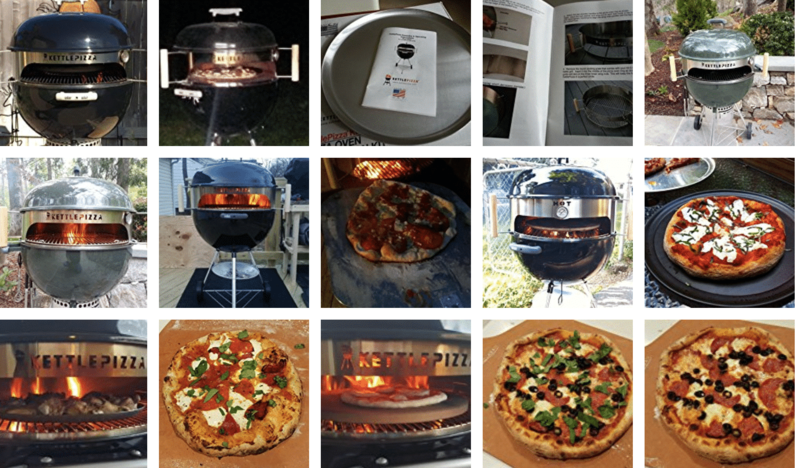 In this recipe we make bruschetta pizzas on our Made in USA KettlePizza? It’s easy and I encourage you to try it. This guest recipe is courtesy of KettlePizza Ambassador Kim Stanfield of the Boo Boo Qued BBC Competition Team. You can read more about Kim and Mic Stanfield at http://www.BooBooQued.com. First we cut our favorite artisan bread – ciabatta, French, crusty loaf, brioche – your choice. Slice into about 3/8″slices. Place the bread on your KettlePizza metal pizza peel, leaving a bit of space in between each piece of bread. Lightly coat your bread with melted butter, or olive oil, and lightly toast in your KettlePizza by placing the peel right on the stone for a couple of minutes – no need to take the bread off the peel. 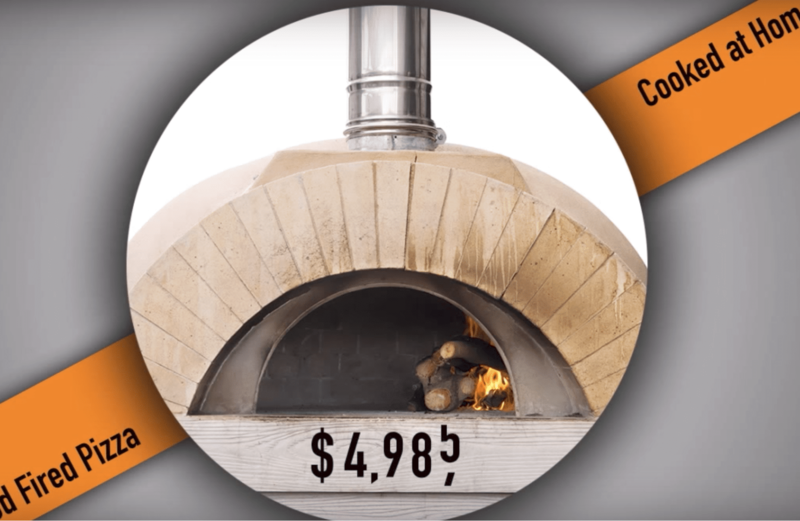 We usually have the temperature in the “pizza” range. This should only take a minute or two. Be sure to wear a heat-resistant glove as the metal of the peel will get very hot! Have a place to land your peel that won’t burn or melt. Now, coat your lightly toasted bread with your favorite sauce flavor – pesto, garlic butter, tomato, etc. Add a bit of cheese – your choice: mozzarella, brie, cheddar, American, fontina, Muenster. For toppings, add your favorite pre-cooked meats (this is a great way to serve the leftover meats from this week’s dinners). Be creative. And let your family and friends add their favorites – pepperoni, buffalo chicken, lobster, shrimp, meatballs, whatever they like! Yum. 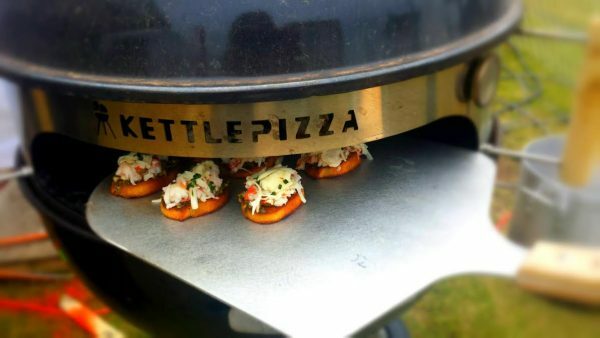 Now put the peel back in the KettlePizza, toast and warm up the meats (you can even add more cheese). Just a few more minutes…. Pull out the peel and with a spatula, remove the bruschetta pizzas and serve them up. Now celebrate and enjoy!